3) Great summary video on prescribing running shoes. 4) Are your patients using their Short Head Biceps Femoris to compensate for a lack of hip extension in closed chain movement patterns? Kathy Dooley thinks so and discusses more clinical pearls in this phenomenal anatomy post. 5) Zac Cupples cleans out his nose and moves better – another first-person perspective on the PRI rabbit hole. 6) Lance Goyke goes over the non-popular functions of the Serratus Anterior: Rib Cage Retraction, ER Lower Ribs, IR Upper Ribs, Contralateral Translation of the Thorax, Contralateral Thoracic Rotation. 7) NOI goes over the importance of the Sural Nerve. I actually just had a patient this week who thought she had a sprained ankle, but it turned out to be a sural nerve pathology. Her symptoms were resolved after 1 week. I created a chart with all the neurodynamic tensioners in this article. 10) Sometimes tibial IR mobilizations can be too provocative. Shante Cofield goes over a smart alternative tibial IR mobilization that unloads the joint and gives some indications of which patients will likely benefit from this mob. 12) The Nordic Hamstring Exercise for preventing hamstring strains is something you should know about. 13) Zac Cupples reviews Interdisciplinary Integration with some great information on the over-achievers, vision, and even the auditory system..
16) We’ve been using this approximation and positional release technique in our clinic with some success. For one patient, the approximation aspect provided >50% improvement in ROM. 17) “There is no lymphatic system in the brain, so the brain uses cerebral spinal fluid to clear the toxins that build up in the brain during the day, and yep you guessed it, this process only happens during sleep.” -Paul Lagerman goes over the correlation of Pain and Sleep. For more articles on sleep, check out the references from this article. Short Foot or the Toe Spread Out Exercise? Here’s one of the answers. 19) “And without the ability to regulate our basic needs, engagement with the environment thru sensorimotor processing is limited. This is why peripheral vision is decreased during stress (they literally have tunnel vision) and it’s probably why movement suffers because if you can’t perceive sensations accurately you don’t make good motor plans.” -Seth Oberst writes a great piece reviewing the Polyvagal Theory and correlating it with Maslow’s Hierarchy of Needs. Read it. 20) This article covers a ton of neuroscience – top-down & bottom-up influence, expectations, biases, attention, and perception. Very applicable to what we do in the clinic. Expectations influence perception. Don’t forget that mobility (degrees of freedom) dictates the amount of available patterns. This is one of the reasons why 9 year olds have more variability than 70 year olds. 25) I always enjoy feeling awkward when I move. It’s good for your body and your mind. Here’s a couple ways to feel awkward in a “Primal Warm-Up” from Andrew Reed. Give it a try and be the weird guy in the gym. 29) Dean Somerset goes over anterior hip anatomy, Sahrmann’s anterior femoral glide syndrome, and provides a few isolated hip exercises. 30) Eric Cressey with solid training advice as always: incorporating single leg pauses, rotational low rows, RTC exercises after overhead work, and different strength qualities. 31) “In intermediate and fast fibers mitochondria are developed by pushing the fibers into light acidity (slight local fatigue), then backing off and recovering aerobically over and over.” -An interesting read from Pavel on long rests for capacity, the effects of acidity, and why we should focus on the mitochondria rather than the energy systems. 33) CrossFit is always a fun discussion topic on social media (for better or worse). These are two of my more popular articles. This one elaborates on what McGill discusses in the above article. This one discusses a common CrossFit mistake that most people miss. 34) 4 Unconventional Fat Loss Methods from Mike Robertson: Low Intensity, New HIIT, Focus on Recovery, Front Load Energy System Work. I like the pyramid in this article. 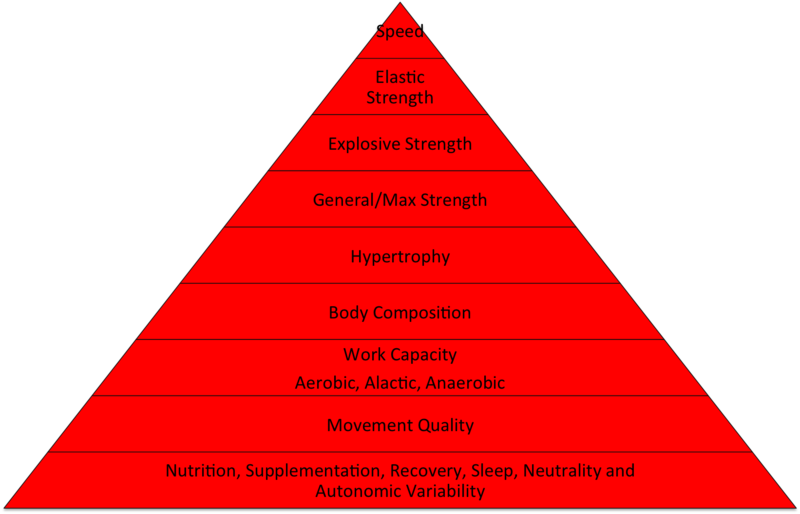 35) “Begin with the end in mind” Mike Reinold goes over periodization. I first heard about the Undulating Model from Cal Dietz a couple years ago – very interesting stuff. 36) Eric Cressey has the best Baseball stuff out there. If you or your clients have any interest in this sport, read this quick post here. And here’s another one on some things that should change in the Baseball Culture. “Autonomy in the training process is a client’s ownership of their program, understanding that while they are provided structure and coaching, they are the one executing the movements and looking to improve upon their given goals. Mastery is the ability to perform the process of the given program to the point where variables – movement type, loading scheme, structure – need to be altered periodically to maintain both psychological interest and physiological adaptations. 38) I recently had a patient that introduced me to Jeff Galloway and his run-walk-run program. It’s not just for beginners. It’s for performance. Very interesting. 44) Chris Beardsley goes over all the Kettlebell Research. The conclusion is that Kettlebells are awesome and you should use them. 48) MRI Knuckle Cracking (shared by Jon Herting). Here’s the cavitation article on pubmed. 57) Research and evidence is very important. But don’t become a Research Snob. 58) Communication may be the most important part of our jobs. Here are 10 Tips to improve it. Zac Cupples‏@ZCupples – Just because humans are adaptable doesn’t mean the adaptations will be beneficial for that individual’s well being. Aaron Swanson‏@ASwansonPT – Effective communication skills are a pre-requisite to effectively teaching patients about pain.